Colin Dymond, Associate of The Inner Magic Circle. This site is under construction so please give Colin a call for more information on how to get the best entertainment for your event. 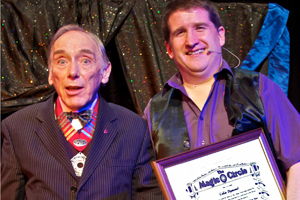 Colin Dymond gained membership of The Magic Circle with his close up magic skills. Colin receiving his Associate of The Inner Magic Circle from the president Jack Delvin. Colin has a great cabaret show featuring a mix of Magic and Ventriloquism with audience participation in such items as Omelette Roulette and of course “The Mask!” Show length from 10 minutes to a whole evenings performance.